I know that a lot of TP friends, geeks and techies actually see Starbucks (or any cafe, for that matter) as a 'tambayan'. Not sure if many of you smoke. 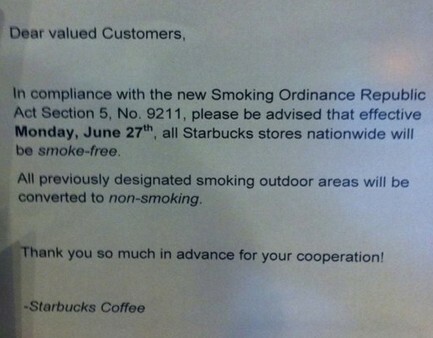 But I thought I'd inform you that starting June 27th, all Starbucks stores nationwide will be smoke-free. Starbucks is running this campaign in compliance with Section 5 of Republic Act 9211 or the Tobacco Regulation Act of 2003 and in support of MMDA's efforts to make NCR a smoke-free region. Smoking kills. Life is beautiful. Thumbs up, Starbucks. Let see if this new rule will reduce their customers. GO #Starbucks Go!!! This law is for the 2nd-Hand smoker! all public places should be smoke free. kung gusto manigarilyo eh umuwi na lang sa bahay at dun sila lumanghap ng yosi nila. pero i'm sure maraming lulusot dito, as you know starbucks may mga outside tables, hanggan san ang "coverage" ng starbucks, pwedeng sabhin ng mga magyoyosi tatayo sila at pwede na nilang sabhin wala sila sa starbucks. Finally, you are doing the Lord's work! Starbucks, please add almond milk as an option since soy milk has been shown to have some serious negative medical side effects. I have been a Starbucks customer for more than ten years and only recently found out about the horrific cruelty that goes on at most U.S. dairy farms. I have made the decision everyone needs to make to only use dairy that comes from a certified humane source. Unfortunately, Starbucks does not offer such dairy and we need a humane and healthy alternative until you make the switch to certified humane dairy. Studies show that soy milk actually has very negative health side effects and many doctors, including mine, are recommended against ingesting any soy products. Almond milk would be a humane and healthy alternative. Let us enjoy our Starbucks without harming animals and without jeopardizing our health! Keep your Cancer Sticks outside! !